Image by doctor paradox via FlickrFinally. 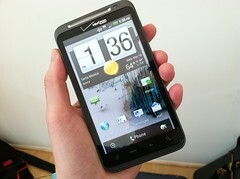 The long-awaited HTC Thunderbolt from Verizon hits the stores. Amazing low price without contract. The newest of the HTC phones is a single-core device, but fast nonetheless. Faster than you'll need right now. Oayk, but this will likely change in 2011 when typically developers just don't care about optimizing their apps. If you want Verizon, you definitely should take a closer look.